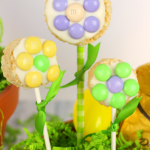 These adorable OREO pops are the perfect treat for any Easter basket! 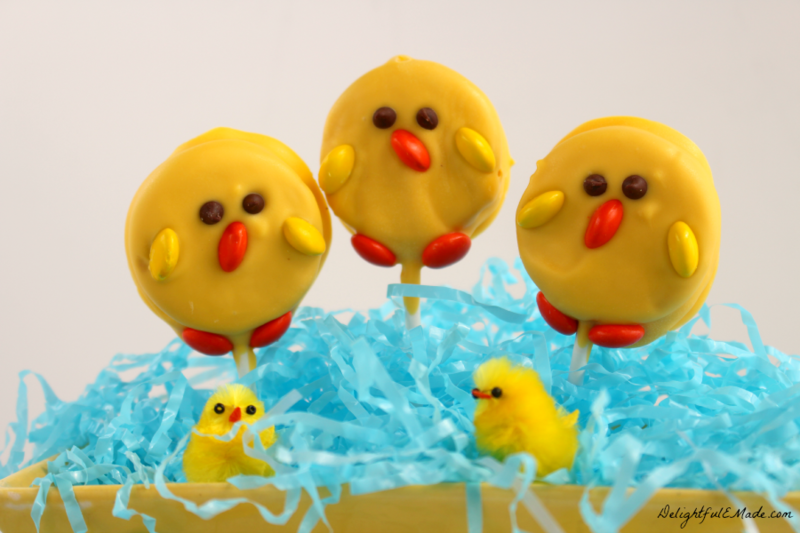 With just 4 ingredients you’ll have some cute little chicks perfect for celebrating spring! Once the snow finally melts and we begin to see the first signs of spring, I get very excited for Easter! For me, we always celebrated Easter with a surprise Easter basket, followed by church and then a big Easter feast. 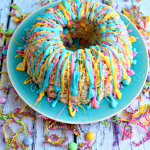 As a child, Easter was just as great as Christmas knowing that when we woke up in the morning there would be a big basket of sweets waiting for us. 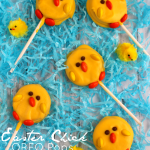 These Easter Chick OREO Pops are perfect for adding to those Easter basket surprises! Made with just four ingredients, these OREO pops couldn’t be easier to make! 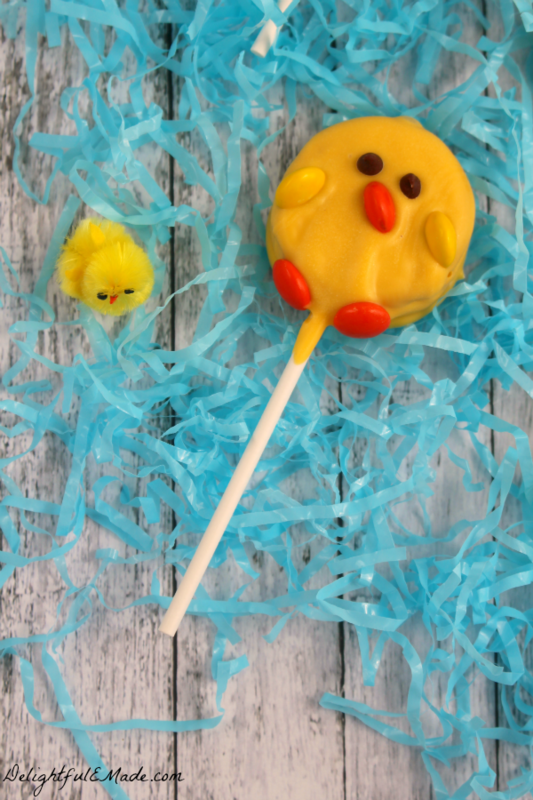 Using yellow candy melts, Golden Double-Stuffed OREO’s, mini chocolate chips for the eyes, and yellow & orange candy coated chocolate candies for the feet, wings and beak, these come together quickly and easily. Before you begin melting the yellow candy melts, I recommend getting your other toppings ready to go. 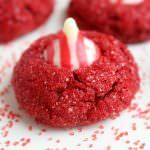 Cut the candies in half, and pour the mini chocolate chips into a small bowl and have all within close proximity. 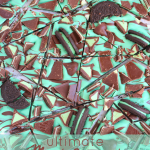 Have a piece of waxed paper on a baking sheet to place the OREO’s once you’ve dipped them in the coating. Once the OREO’s are dipped in the chocolate you’ll need to work somewhat quickly placing the eyes, beak, wings and feet before the candy coating sets. 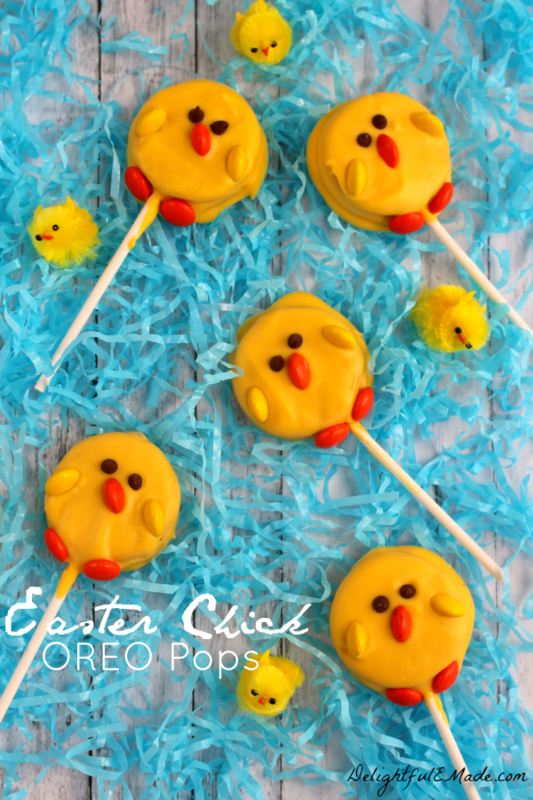 These adorable OREO pops are the perfect treat for any Easter basket! 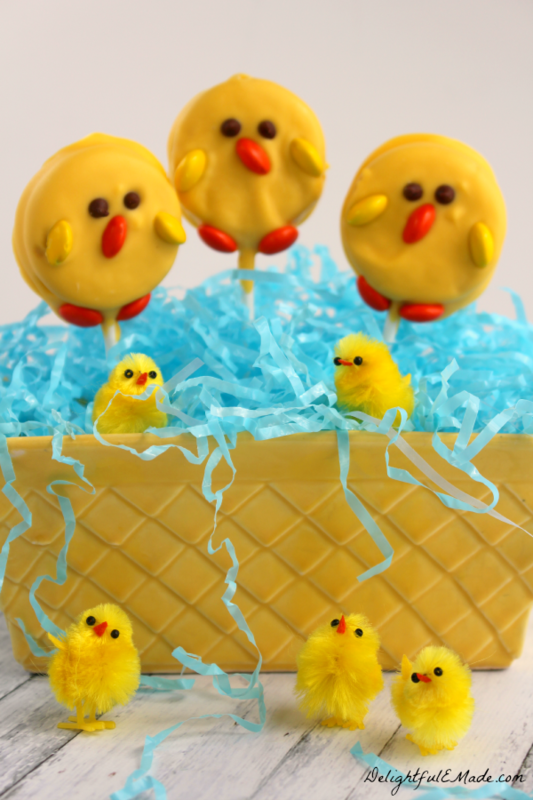 With just 4 ingredients you'll have some cute little chicks perfect for celebrating spring! Place a large piece of waxed paper on a flat surface or baking sheet. Place the candy decorations close by have the candy pieces cut in half so they are ready to go. In a microwave safe bowl, start by melting half of the yellow candy melts (according to package directions). Dip the end of one of the lollipop sticks in the melted yellow candy coating, and then insert into one of the OREO cookies. Repeat for as many as you want to make. Then submerge the cookie into the yellow candy coating, and place on the waxed paper. Place two mini chocolate chips for eyes, place a half orange candy for the beak, place two yellow half candy pieces for the wings, and two whole orange candies for the feet. Let the cookies set to completely cool and harden before removing from waxed paper. Wrap or store in an airtight container. Enjoy! These are cute cute cute! My kids would love them. They don't look too hard to make either. Thanks for joining the Family Joy Link Party! These are so cute! 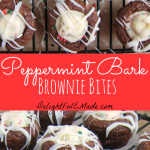 I've pinned so I can make them with my grandchildren! 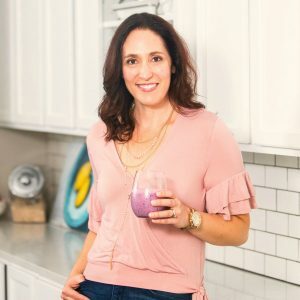 Thank you for sharing on Party in Your PJ's. These are cute! Thanks for sharing at the What's for Dinner Party. These are so fun! 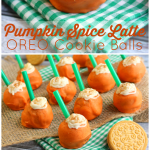 Who knew OREO cookies could be made even better :-) Thanks for sharing on MM. Pinned and will be featuring this on tonight's party.